If hedgerows were not graced with such wonderful springflowers as Primrose, Bluebell, Greater Stitchwort and Red Campion, it would be easier to welcome the blanket of white with which Cow Parsley covers and smothers everything. By the calendar alone Cow Parsley is one of the easier umbellifers to identify, because it comes into flower before any of the other common members of this 'much of a muchness' family of wildflowers. Cow Parsley is a tall downy plant growing to a metre or more in height. This wildflower can be either biennial or perennial, spreading rapidly in rich damp soil both by seed and via its rhizomes. The umbrella-shaped flower ubels are typically 3cm to 6cm across, with larger petals near the outer edges of the florets. 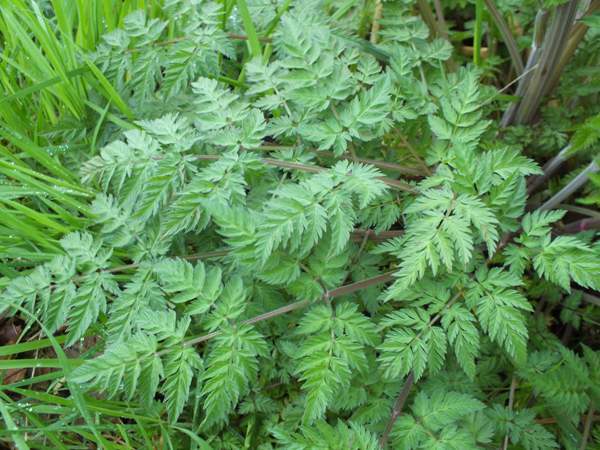 The distinctive leaves of this common wildflower (see above) are finely divided into many feathery leaflets. The leaf stalks and the hiollow stems often turn a rich purple as the plants age. Fruits of Cow Parsley are like elongated smooth teardrops; they gradually turn black as they ripen. This member of the Carrot family is very common in Britain, Ireland, and most of northern Europe. 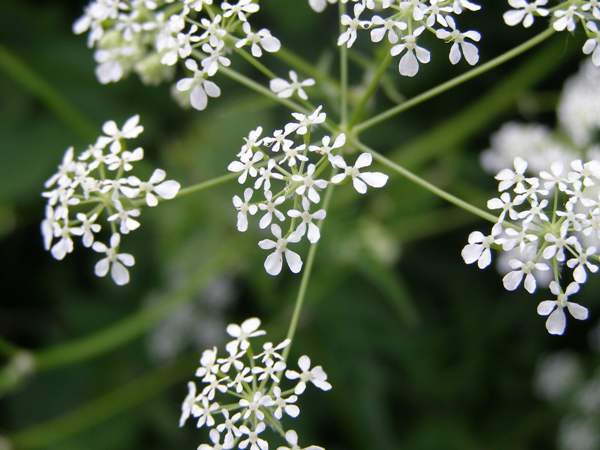 In North America, Cow Parsley is an introduced alien and considered to be a nuisance invasive weed. 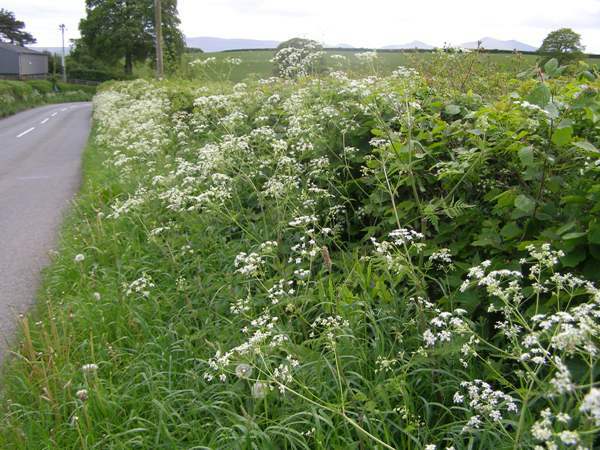 In many parts of western Britain and Ireland Cow Parsley takes over the grassy verges beside hedgerows (as can be seen in the picture below), eventually blanketing out most of the smaller wildflowers. Cow Parsley flowers first appear in April and they last through to the end of June.As these tall roadside wildflowers are dying back so several other umbellifers including Hogweed Heracleum sphondylium and Wild Angelica Angelica sylvestris are just coming into bloom. Anthriscus, the genus name, is of uncertain (to us) origin. The specific epithet sylvestris often implies 'of the woods', but in this instance it is perhaps used simply to denote 'growing wild'. 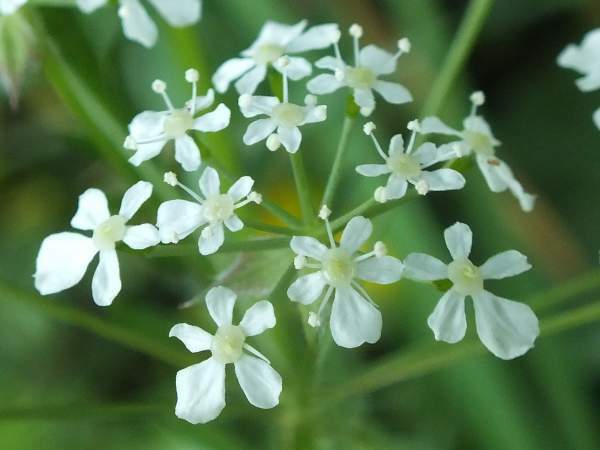 Hollow stems of Cow Parsley are traditional materials from which children make peashooters. 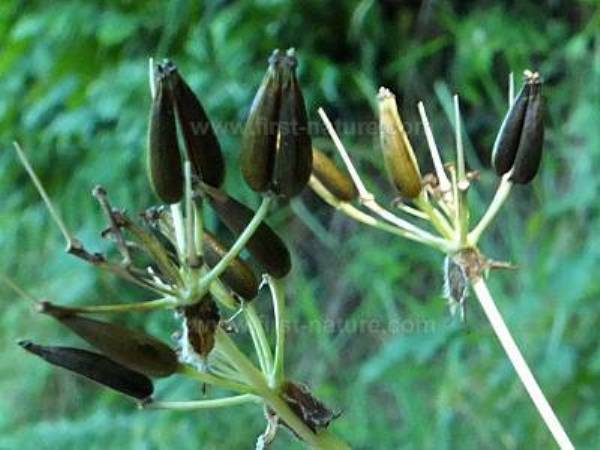 There is a danger, however, that poisonous plants such as Hemlock Conium maculatum or Giant Hogweed Heracleum mantegazzianum might be used by mistake, with painful and possibly disastrous consequences. Hedge Parsley Torilis japonica flowers later than Cow Parsley and its flowers often have a pink tinge. Hemlock Conium maculatum has hollow purple-spotted stems; it is seriously poisonous. Hogweed Heracleum sphondylium is as common as Cow Parsley but produces its flowers in late spring and summer; the leaves are much larger and only coarsely divided. The plants shown on this page were photographed in Wales in May.